Based on Edgar Rice Burroughs’ epic series about a Civil War veteran transported to Mars and caught up in war and romance there, John Carter mostly delivers . . . The visuals are stunning, with the CGI well-integrated into the live action (although the 3D, added in post-production, is unnecessary). The dramatic battles are exciting and the supporting cast is strong. Why, then, did Disney stupidly do everything they could to ensure that it would fail? Then, like the schemers in The Producers who want to ensure their show is a flop, they set out to antagonize the critics, who might have been able to help them promote their movie. Much of the media was shut out of interview opportunities and then at preview screenings everyone – including working press – had cell phones and laptops confiscated and were wanded. This TSA-like sideshow was announced with the Orwellian title of Level One security making one wonder what higher levels would have entailed. "An exciting adventure tale . . . when it finally gets under way." Of course it was an exercise in futility. First, because there’s no real interest in 2D cell phone photos of blurry 3D images. Second, unless Disney has its own army, there will be no such security at the more than 3 500 theaters where the film is scheduled to open. And why? This is an exciting adventure tale when it finally gets under way. The movie opens with too much prologue jumping from Mars to 1880s America to the Civil War back to Mars. By the time we’re back on Mars, with a baffled John Carter (Taylor Kitsch) trying to figure out how to move under the lighter gravity, we have to differentiate four different groups that are working at cross-purposes. There is Dejah Thoris (Lynn Collins), a scientist and a princess whose father (Ciarán Hinds) is about to sue for peace by forcing her to marry conqueror Sab Than (Dominic West). Than is being backed by mysterious figures, headed up by Matai Shang (Mark Strong), who have given him the destructive power of the ninth ray. Meanwhile Carter has been captured by the Tharks, a green four-armed people who raise their young from eggs. Their leader Tars Tarkas (voiced by Willem Dafoe) takes a liking to Carter, especially when he sees him leap great distances. The early part of the film brings unfortunate comparisons to the 1984 adaptation of Dune in that there’s a lot of information to assimilate so that you can follow what’s going on. By the time you realize that Dejah Thoris is smart, a babe, and good with a sword, the movie is good to go. Kitsch is a serviceable hero although he doesn’t leave any lasting impression. The most memorable characters are the Tharks, voiced by Dafoe, Thomas Haden Church, and Samantha Morton, who show us how far removed we are from Jar Jar Binks. The visual design is a major plus, with images that seem to have popped out of illustrations by the legendary Frank Frazetta. 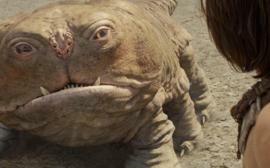 So if you want to see John Carter on the big screen, see it quickly. Audiences have not been prepared for the film and Disney is supposedly already prepared to write off the $250 million film as a loss. Worse yet for the studio, in two weeks the movie version of The Hunger Games arrives, and the same target audience drawing a blank on Princess of Mars is already snapping up tickets for the other film.